To piggy-back off of a previous post, instead of buying gifts for each other for the anniversary of our first date, the beau and I decided to take a day trip to Woodstock, NY. I had only driven through this little town after hiking once before but he was more familiar with it because his art had been featured in a gallery down there. I got up early to run my long run, shower, have a hearty breakfast at our regular spot and hit up the local car wash thanks to the HUNDREDS of crows that live in the trees outside of my apartment this time of the year. We were on the road by eleven and at the trail head by noon. A co-worker suggested that we hike up Overlook Mountain, which I didn’t know the beau would be interested in doing. Luckily, I was wrong! I think the short distance (just over a mile) combined with the fact that it was on an old carriage road were the selling points. We bundled up and started up the trail! We passed a bunch of people who were already heading back to the car, it was a gorgeous autumn day, and within no time had to stop to take our coats off. By the time we made it to our destination, it was getting a little grey out and snow flurries were floating in the air. 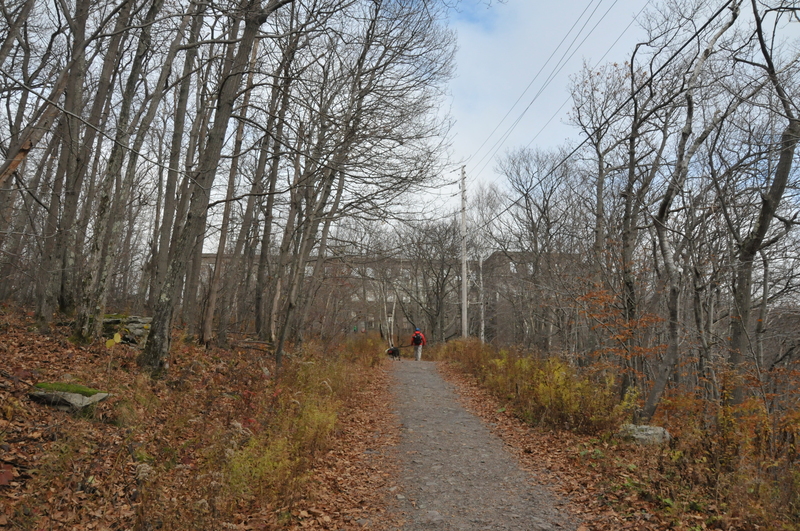 We decided not to hike to the fire tower and just to the abandoned hotel because we wanted enough time to walk around town before dinner. I loved it! I read up on this old building and it was originally built in 1871 but unfortunately burnt to the ground in 1923. It was so much fun to walk within it’s walls and imagine what it had looked like over a hundred years ago. 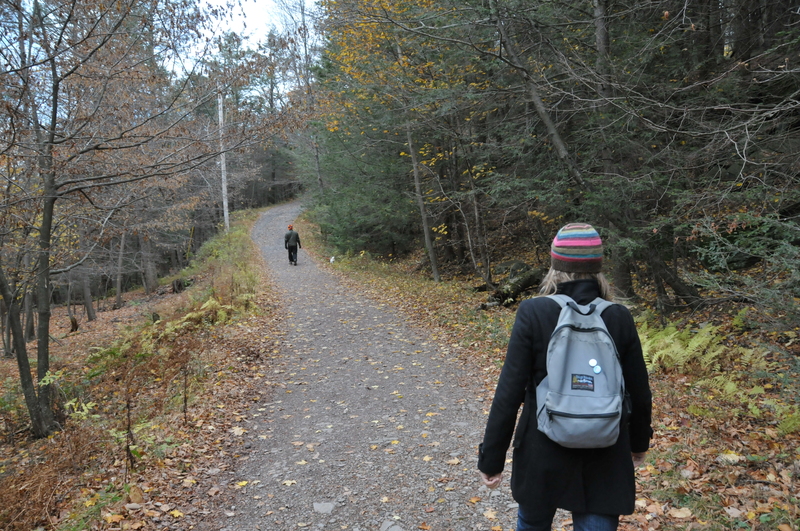 We spent quite a bit of time wandering around but it got cold fast, so back down the trail we went. And then decided to explore the Buddhist monastery across the street from where we parked! There was a retreat happening but we did get a peak inside of the meditation hall. Once downtown we shopped, visited a couple of galleries, dreamt about purchasing antiques and laughed plenty of laughs in a neat children’s toy store. Seriously, what are those naked baby angels? And did you ever get to dissect owl vomit? The beau had originally suggested a trip to Woodstock because he had found an all vegan restaurant for us to have dinner at: Garden Cafe on the Green. Reservations were at five and we had a cute little seat in the window. For appetizers: the caesar salad with toasted almonds and the quesadillas with roasted red peppers and kalamata olives. The salsa, guacamole and sour cream were a big hit in my book! Dinner for him: pasta with “meatballs” and garlic bread. A classic! Dinner for her: wild and brown rice mushroom saute, cornmeal crusted tofu with red wine fig sauce, butternut squash terrine with pistachio swirl and roasted brussels sprouts. Out of this world delicious! For dessert: warm chocolate brownie with a scoop of vanilla ice cream. This serving was huge! Bigger than my hand! My only criticism of this rich, creamy dessert is that it wasn’t a brownie; it was a cake. Of course neither of us complained! It was a wonderful day. Not buying gifts for each other was a great decision and I enjoyed spending time with him rather than money on an object. I would highly recommend this small town to any New Yorker looking for a day trip, even with the winter weather pressing us. Just remember to bundle up and hold the hand of your loved one.